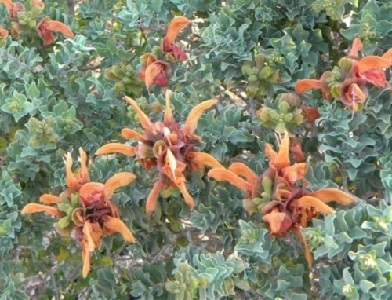 A lovely and unusual sage shrub from Southern Africa, with rusty orange flowers in June to late autumn. The flowers contrast well with the grey/green aromatic leaves, with the whole plant growing to a height of 1m-2m. This looks very exotic in an English garden, and adds good late colour to a border. Dune Salvia looks best in an informal shrub border and rockeries. It is also suitable for a larger herb garden as the leaves can be used as a culinary herb. It will tolerate coastal sites. Good for Mediterranean gardens. Plant in a sunny spot in light well drained soil. This plant is described by the South African Botanical Institute as hardy, but it may be best to protect the roots in colder parts of the UK. Frost damaged plants often re-sprout from the roots. Pack of 10 seeds. Sow any time in warm conditions, or spring/summer. Sowing instructions and a colour photo are printed on the packet. Sow Sow Spring/Summer in moist seed compost. Do not cover the seeds (except for a light cover of vermiculite if you prefer), as light is needed for germination. Keep at 20-25° C and germination takes 10-14 days. Or sow any time when germination temperatures can be met and seedlings grown on with some warmth and good light. Pot on the seedlings and plant out after the last frost in a sunny well drained spot. Grow Mulch roots in winter to protect against frost or bring into a greenhouse. Trim back about 1/3rd after flowering. Plants get woodier as they mature and look best if replaced every five years or so. Plants can be reproduced from stem cuttings, taken from non-flowering stems in spring and summer.